…first off, thank you all for your kind words on my project life fail post a few weeks back. it means a lot to me to have friends here who not only have sound advice but also care enough to take the time to share it! I am happy to report that I found my groove. and I now have five weeks documented in a pretty orange album. which means I am – at least for the next 54 hours – caught up! during the course of one particularly supportive exchange (thank you cynthia!) I decided to share a few thoughts here about my learnings and my process. I’m not sure how many of you even know about project life, but if you’re curious or thinking about starting – or even if you’re doing it already – I hope you can benefit a bit from the lessons I learned. over many long hours (and a few glasses of wine, thank you lydia!). these past four weeks. in a nutshell – and in case you really don’t care to know about project life 🙂 because I think these first four points are good for just about anything! and learn how to use your printer! I want to start by saying I LOVE this approach to documentation. 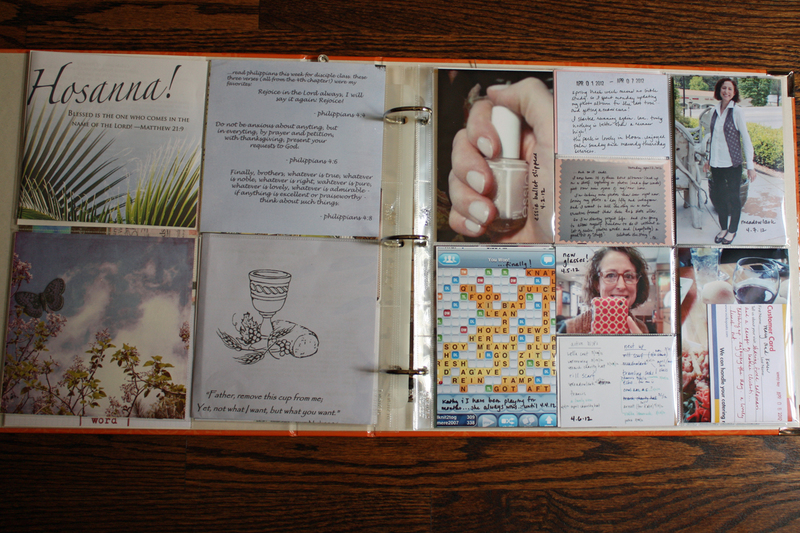 I have been very good about documenting my life since 2007 – I have photo albums (which actually go back to 2003) and scrapbooks and photobooks and journals. but it’s always felt a bit disjointed. or duplicative. like the trips sara and I took to nyc. they’re in scrapbooks not photo albums. 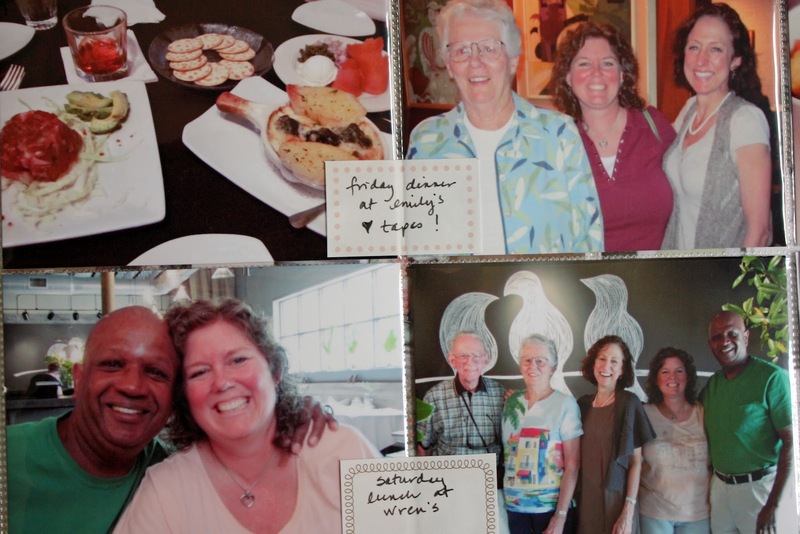 but the trip we took to mexico is in a photo album and a photobook (ditto a few other trips). 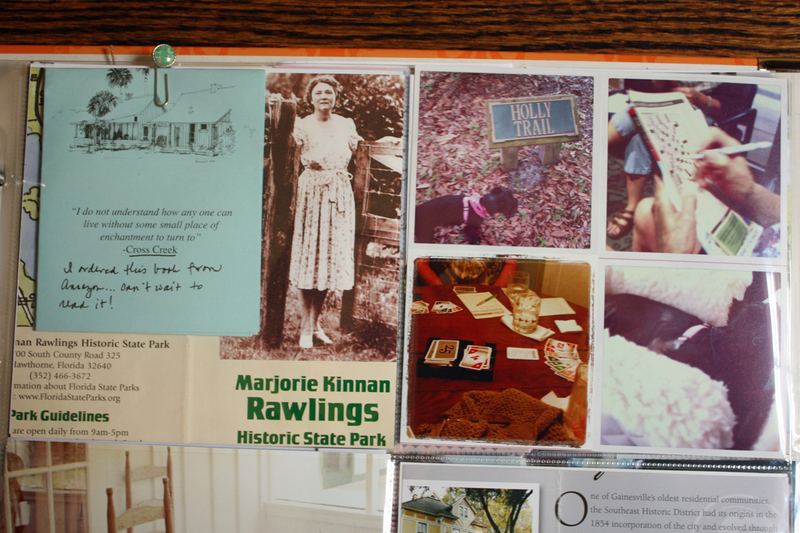 and all the “stuff” of my life – tickets, yarn, letters and cards, really anything that’s not a photo! – ended up only in my journals. and those journals are only for me (right now). 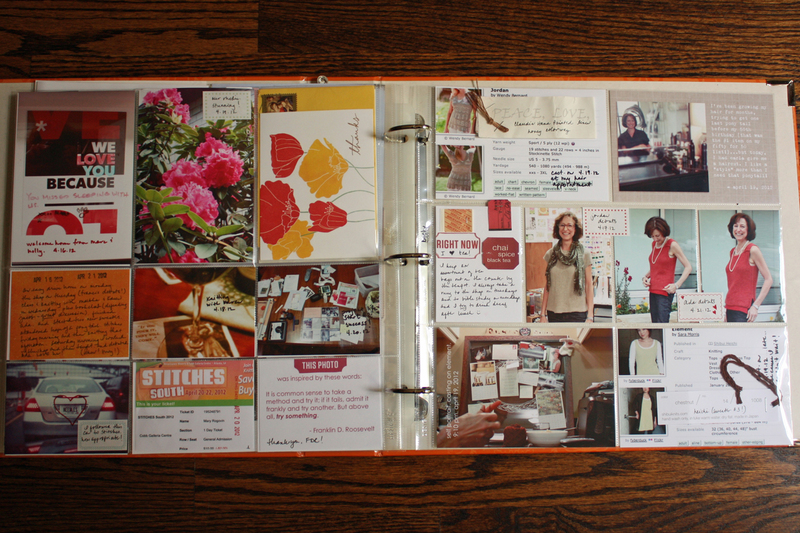 so project life – which is really just a 12×12 album and a bunch of page protectors – appeals. 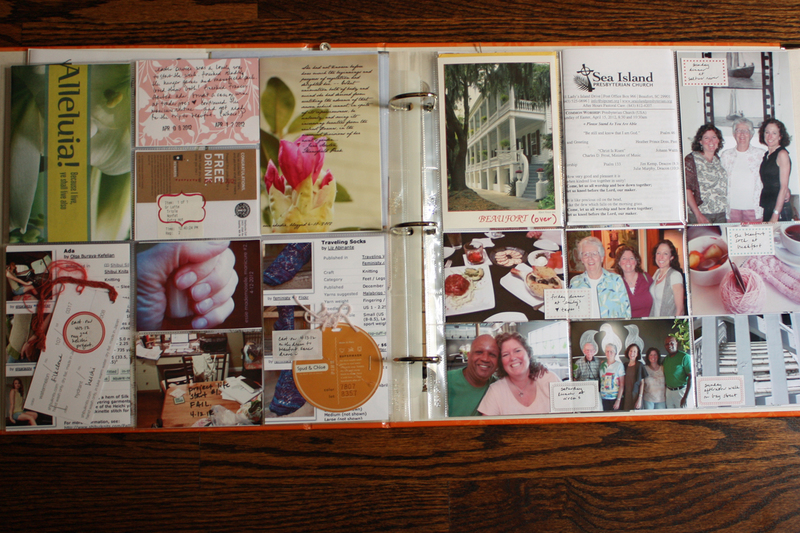 I think I can combine the photo album with the scrapbook with the not-personal part of my journal. I still think I’ll do photobooks for “special” events or trips. and I am definitely still keeping my journal. 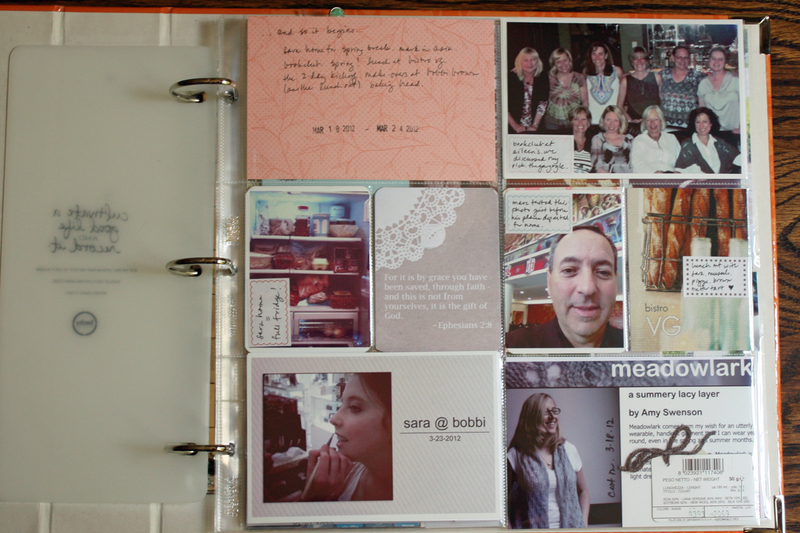 but now many of the bits and pieces I used to put there, will go in my project life album to share. and that album can be as “scrappy” as I feel like making it. 1. I am organizing my spreads by weeks…mostly running sunday to saturday. but the week we went to beaufort I used the left half for sunday to thursday and the right half for beaufort (friday to sunday). sunday mornings are a good time for me to work on project life, so it seemed like having my weeks end on saturdays made sense. we’ll see. 2. 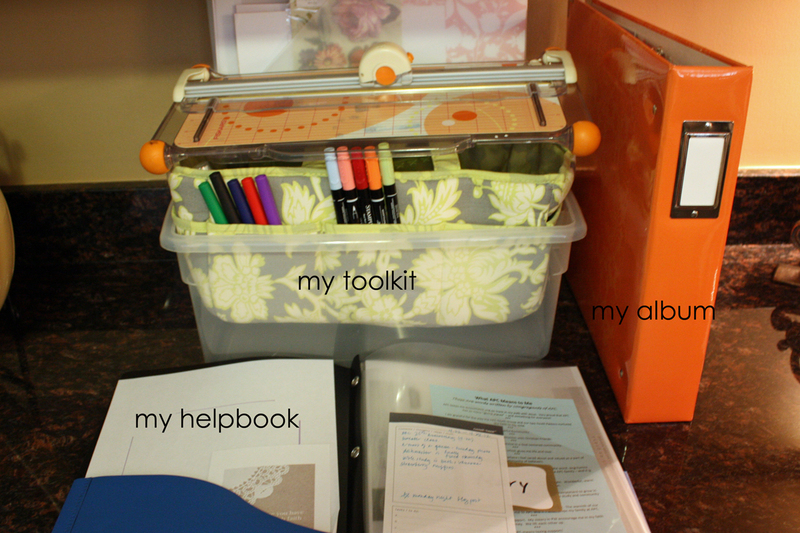 I’ve gathered a small collection of supplies (dubbed “my toolkit” below) – pretty papers, adhesive, stickers, pens, inks, a few stamps, markers, my paper trimmer, and the box of project life page protectors – into a plastic bin. I’m hoping I won’t get sick of seeing that bin on my kitchen counter, because I do love having everything I need right there! 3. before I started, I downloaded a few journaling and photo template packages from paislee press and this free one from paper peonies. I printed off the preview pages for each package and labeled those to show the filenames. I put those pages and a plastic pocket (to hold this week’s “stuff”) into a heavy duty folder (dubbed “my helpbook” below). 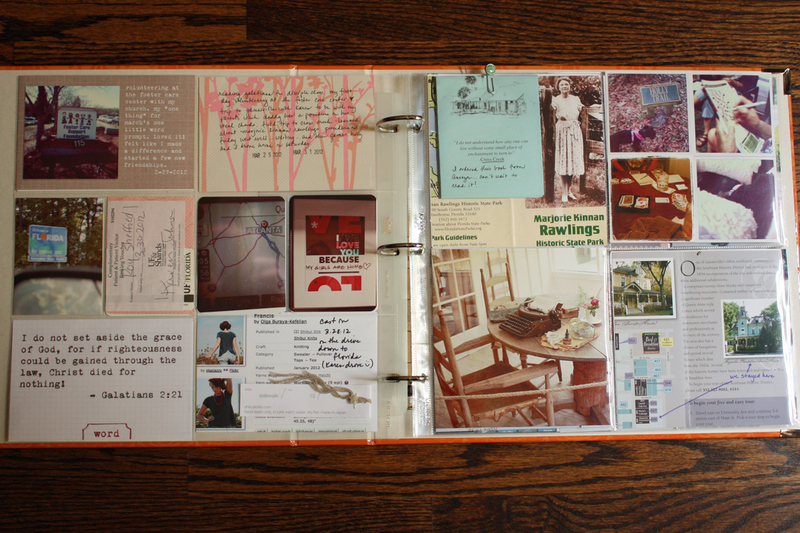 when I want to print off a journaling card, or find a digital element for a photo, it’s much quicker for me to page through my folder than to pore through the documents on my computer. 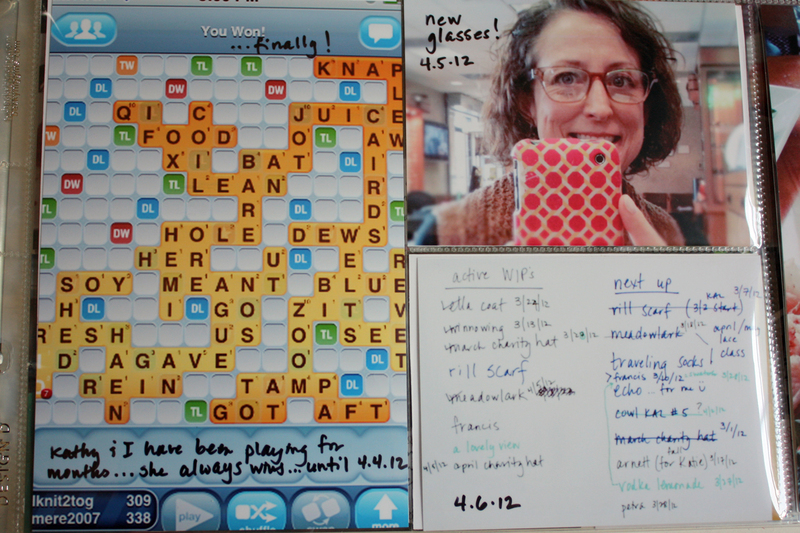 4. during the week, I have a big post-it in that folder to capture the key things. I jot down things there as they occur to me and then I use that post-it to organize my spread, decide the photos to print, etc. 5. I’m mixing up my own handwriting and computer journaling. I really like having both. 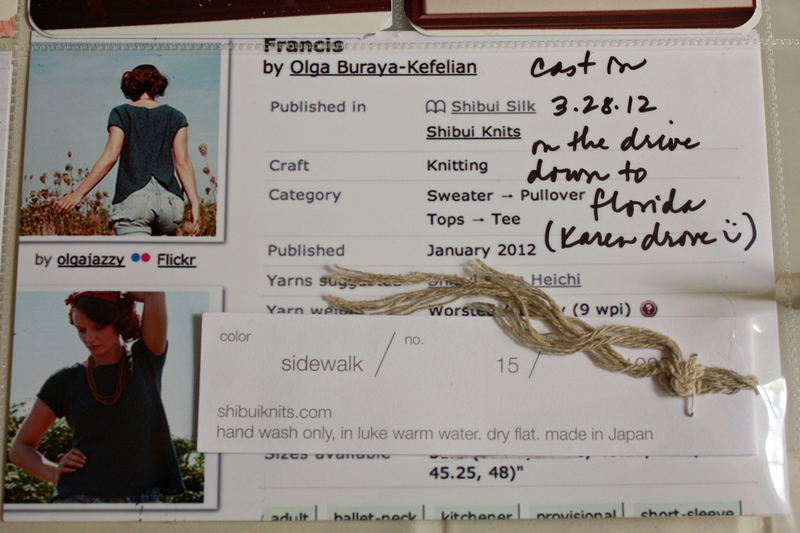 for each knitting project I cast on, a pattern grab from ravelry, a label and snip from the yarn, and the date. here are the five weeks I’ve completed. you can click on all the photos to see them bigger. and maybe clearer. and a handful of close-up shots to highlight things I especially love about the album. 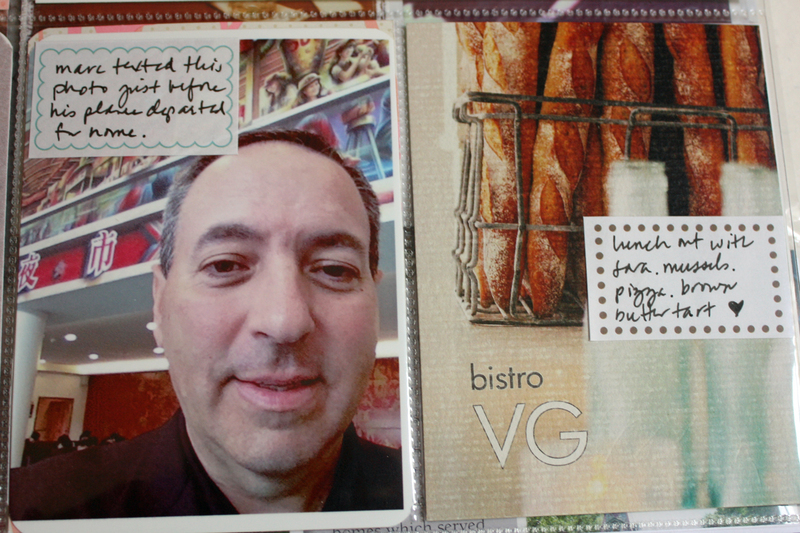 first, from week 1, a photo that marc texted me (he was tickled to see I’d included it) alongside the postcard (cropped) that accompanies your check at bistro vg. the two-of-us photo from that lunch was not album-worthly, but this card made up for that. you can also see my love of labels. these are the martha stewart ones from michaels. and now I’m no longer attempting to round corners (whew! 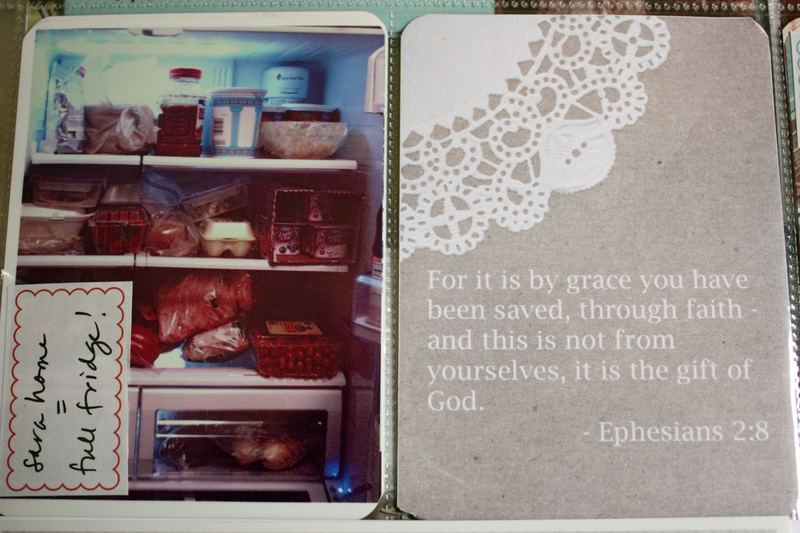 ), but love the instagram photo I cropped and the paislee press card for the bible verse. and now from week 2, the format I’ve settled on to document project cast-ons. a 6×6 grid…. this is great if you have big “stuff” (that you don’t mind cutting – or folding – or combining the two – the left slot has a cut page with a folded page clipped to it)…or if you have instagram photos that are great printed at 3×3, like the slot on the right. from week 4, a screen shot from my iphone. 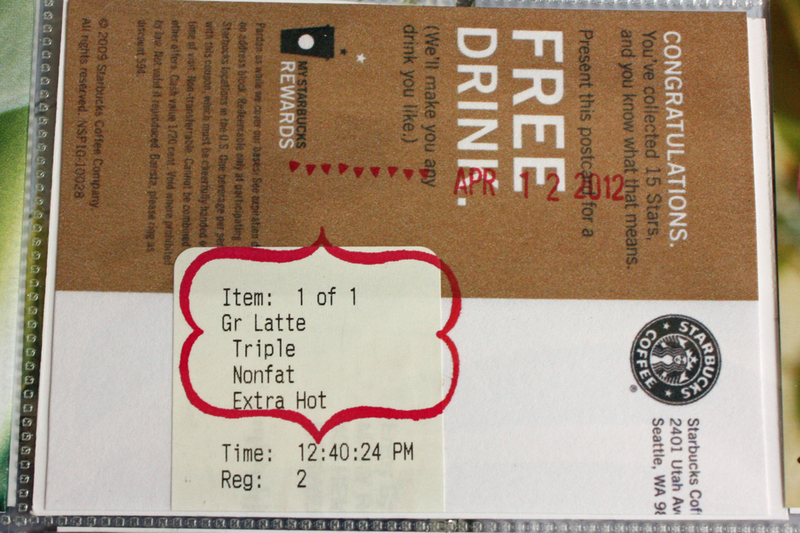 redeeming a starbucks reward coupon. I get these about once a month and hope to include them in my album (especially if I order something different…slim chance!) 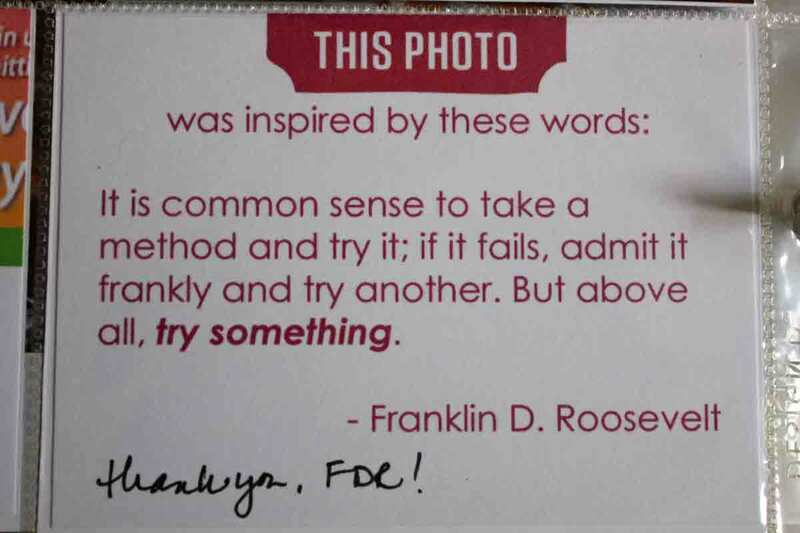 I scanned the coupon and then cropped it to print here…along with the label from my drink and a stamp – this is one of the “scrappier” entries, for sure! labels on the outside of the page protector for photos that “go together”. again, I welcome any and all input, feedback, questions, etc. and most of all, thank you for all your support! I think this is awesome and it will be amazing for you to look back on these as time goes by. It seems like a lot of work, though, and I'd be worried that I didn't have enough interesting things to include each week! as always some great ideas, may jump into this in the fall since it'll be andrew's senior year (really?). i need to really learn how to use photoshop and my printer-some lessons in exchange for wine? happy friday!!!!! This looks so amazing, and I can't wait to see it in person. I seriously admire your creativity and passion for documenting your life. 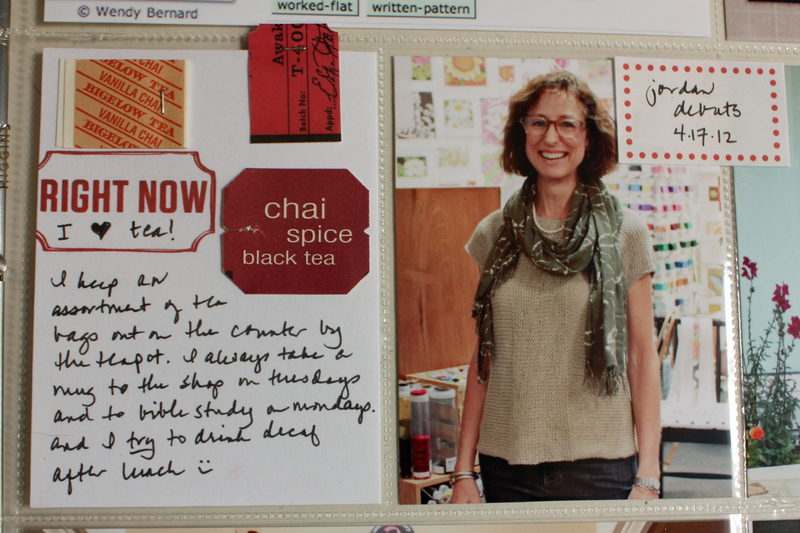 Wow – when do you have time to do all of this and knit? I'm amazed. This isn't a trivial pursuit. A very interesting one and will be amazing to see the journey. I'll have to go back and take a closer look (but I have to find the wrap and turn stuff first). Yay! So glad I "convinced" you to start 😉 I can't wait to see it in real life! I think it looks amazing! You got it! Isn't it wonderful when you find your flow?! Great tips too~ a couple I plan to use. Also, lovin' the connection with all the other forms of documenting life. It looks wonderful Mary! Congrats on just jumping in and doing it. Isn't it amazing how awesome it is when all the parts become one whole. I think the cool thing is how truly wonderful the everyday is. I think that really is the lesson behind Project Life. So happy for you!